Central Coast Council has repeated its call for the community to provide feedback on the draft concept plans for the long-awaited Gosford Regional Library, now on exhibition until Sunday, March 11. Details about the concept’s plans frequently asked questions, information sessions and how to make a submission can be found at yourvoiceourcoast.com. The project will be financed through $8.1m, raised by the former Gosford Council Special Rate Variation, with an additional $7m Federal funding, through the Department of Infrastructure and Regional Development’s Community Grants Program. Two concept plans for the state-of-the-art facility, designed for the Donnison St site at Gosford, are now available to view to gauge public preference. Council’s Director, Connected Communities, Ms Julie Vaughan, said this was an important project for the Central Coast community, helping to meet a range of long-term community needs. “This development will deliver employment opportunities and economic stimulus, and will be a focal point for library services across the region,” Ms Vaughan said. “We have come up with two options, both of which will provide an Innovation Hub for small and start-up businesses and creative endeavours, as well as help support commuters and entrepreneurs by encouraging enterprise development and embracing innovation. 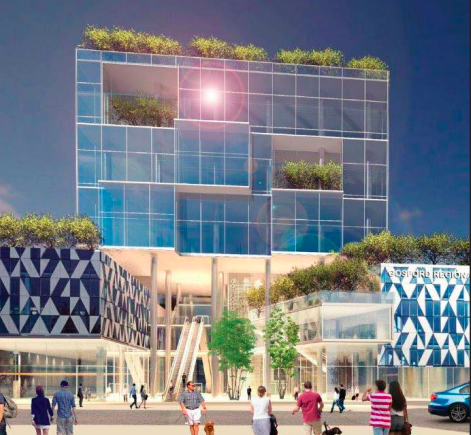 “What we want to know from the community is whether they would prefer to see a three-storey building plus mezzanine, or a ten-storey building that has the capacity to house additional commercial space for lease. “We are committed to the revitalisation of the Gosford CBD and growing it as the region’s capital, and this project is one part of how we are accomplishing that.” Mayor Jane Smith said the community has significant investment and interest in progressing this project, and it was important to get the balance right and deliver an innovative and sustainable learning space for the community. “This is a catalyst project for the revitalisation for the Gosford CBD, and one that Council can, and must, get right for the community,” Mayor Jane Smith said. “Libraries are at the heart of creating livable, connected and sustainable cities, and that is definitely what we want to see for the Gosford CBD.